Newly-appointed Worthing Raiders Rugby Club coach Ben Coulson believes his side possess enough promising young talent to push them to the next level. Coulson, who will be first-team coach next season alongside former Raiders captain and team-mate Jody Levett, felt last season allowed a number of younger guys to impress. Worthing found things tough in National 2 South and could only clinch an 11th spot finish under the stewardship of Kieron Dawson. But Coulson, who was part of Dawson’s backroom staff, believes he saw enough in the club’s emerging talent to give them more of a chance next season. He said: “We’ve got a real core of young local guys in this team. Patrick White came in and had a great breakthrough, which may see him push on next year. “You have also got to look at the performances of Kieran Leeming, George Montgomery and Sean O’Hagan in what was quite a tricky season at times. As well as Raiders’ new coaching pair, Davies also returned as high performance manager for his fourth stint with the club. He has seven years’ experience at RFU Championship side Cornish Pirates under his belt and wants to call on that in his role at Worthing, while also helping Levett and Coulson. He said: “I’d like to hope we can attract a few new players here next season. With the experience I’ve had at a professional level, I’d hope to help Jody and Ben, while looking to bring a few players in. 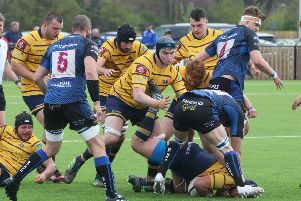 While Davies was with Cornish Pirates, Worthing reached National 1 and that is something the Welshman is aiming for at Roundstone Lane once again. He said: “There are some really talented guys at this club and I think everyone wants a return to National 1. “Obviously, when the season starts out each team wants the same, so it won’t be easy but it could well be achievable. “In recent times, more and more money has come in at this level and with that teams and players have improved. Raiders’ most successful captain, Levett, sees Worthing’s development of youth as something to continue in his time. He said: “The club needs to be sustainable both on and off-the-pitch, with a core of Worthing players at the forefront.